Soil Secrets: Fixing Soil using Carbon: Can Soil Carbon Sequestering be Encouraged and How Does This Change The Water Management Equation? Fixing Soil using Carbon: Can Soil Carbon Sequestering be Encouraged and How Does This Change The Water Management Equation? It's common knowledge that the idea of increasing the amount of soil organic matter is generally a good idea. Its an even better idea if you live in a place on the globe where soils never truly developed a defined zone of topsoil that one can see with the naked eye. Where I live in the arid Southwestern Chihuahuan Desert the only place we can truly see carbon rich topsoil is where lots of natural vegetation was able to grow over many hundreds of years, depositing organic debris and growing lots of roots that finally decay and contribute to this accumulation of decaying organic matter. An example of this might be along a creek or river where riparian vegetation is getting enough water. It's also commonly accepted that soil organic matter (som) increases the soils potential for holding onto water, where its been said that for every 1 percent of increase in soil organic matter you can hold an additional 25,000 to 30,000 gallons of water per acre of soil. That's a bunch if you can increase the percentage by 3-4 or 5 percent. However lets be even more specific on how to calculate this out. For example, it is also commonly accepted in the world of soil science that the carbon fraction of the total soil organic matter is about 58 % and that the carbon part of the soil organic matter is what actually holds the water, capable of holding 10 times its weight So for every 100 thousand pounds of organic matter we have 58,000 pounds of the element carbon which can hold 580,000 pounds of water. A huge number! Water will weigh about 8.36 pounds per gallon if fresh water, less, so 580,000 pounds of water is equal to 69,378 gallons of H2O. Soil Secrets success in increasing the percent of organic matter and soil carbon sequestering. I've attached a inset of a soil analysis so we can see the values concerning the increase in Percent Organic Matter on a trial site we've been watching for 12 years. At the start 12 years ago the site had a raw percent organic matter content of only .6%, slilght over 1/2 percent. The site is sand soil so the bulk density will be higher with the whole acre foot of soil weighing about 4.8 mllion pounds, therefore 4,800,000 X .006 = 28,000 pounds of indigenous soil organic matter. So before Priming with Soil Secrets Biomimetic process, the raw carbon of the site 1 foot deep can hold 19,980 gallons of water. 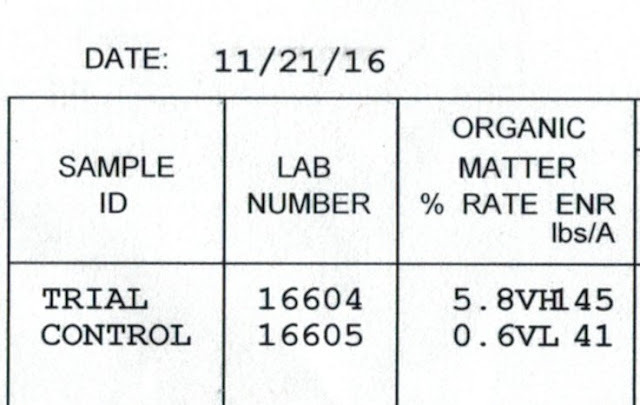 So if you look at the inset of the analysis done on 11/21/2016 you can see that the new percentage value has gone up to 5.8%, which is 278,400 total pounds of Soil Organic Matter. The carbon fraction will be at 161,472 pounds holding 1,614,720 pounds of water which is 193,148 gallons of water per acre foot. That's 4.4 gallons of water in every cubic foot of soil. In conclusion, by using the "Applied Science" of the Biomimetic products invented by Soil Secrets LLC, we have proven that we can accelerate the soil carbon sequestering process faster than the application of soil amendments such as compost, manure or biochar can contribute. The formation of topsoil defined by this Net Gain in Soil Carbon penetrates the earth 24 inches. See the attached photo of a spade of dark top soil that was extracted versus another picture showing the raw site before Soil Secrets. The 24 inch deep carbon rich top soil at 5.8% Soil Organic Matter is a massive accumulation far exceeding what Nature could normally produce over the course of several centuries. 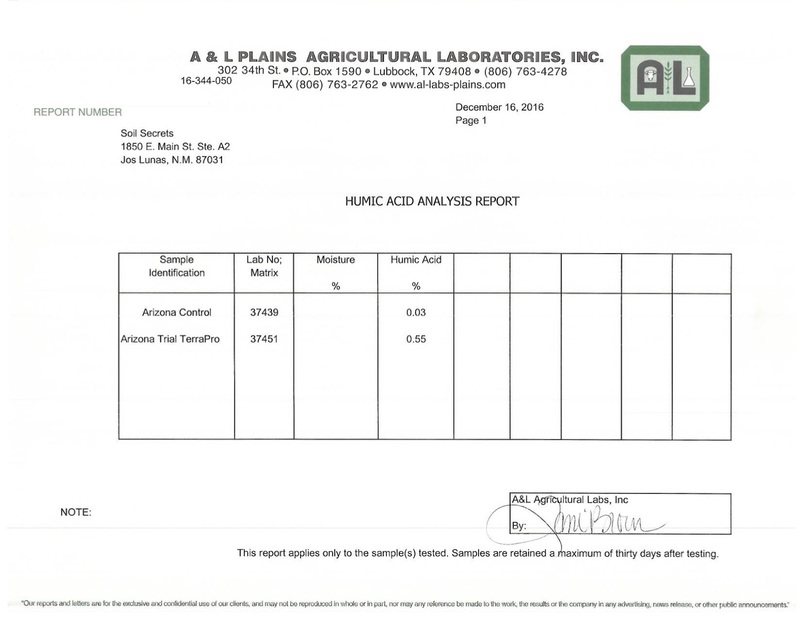 The final evaluation we used to measure carbon accumulation was to measure the Net Gain in what we generically call Humic Acid, which are not really acids, but are carbon rich compounds that resist decay. These compounds also called Humic substances fall under the catagory of "Recalcitrant Carbon" which are not measured using the Soil Organic Matter test. In this case we had a net gain of 24,960 pounds of this type of carbon per acre one foot deep. Deep Spade holding over 20 inches of carbon rich top soil extracted from the test plot. To unlock the secrets of healthy soils through scientific investigation, in order to continue producing products, of high efficacy, fundamental to the biological management of soils. Albuquerque's Soil Conditioner Source! Soil Secrets manufactures products that fix soils, by instigating the natural process of soil formation. Serving: Home Owners, Agriculture and Industry. September 28, 2013 Arboretum Tome Open House.